Vasectomy Shorts can make all the difference. How much is it going to hurt and how long it is going to take for recovery? You go in for the procedure, your doctor gives you the anesthetic and the job is done. But, as the local anesthetic wears off… the pain comes. Your doctor will tell you to expect it. He say's it’s perfectly normal. And he’ll probably tell you to use an ice pack or a bag of peas to ease the pain and swelling. That’s great, but you’re stuck on the couch with a bag of peas in your crotch. Your doctor will probably tell you that as long as you’re wearing proper scrotal support you can get off the couch… but then the numbness from the ice subsides and the pain is back. Pain or inconvenience during the days following your vasectomy. I felt the same way when I had my vasectomy in 2009. So I set out to find a better way. That’s when Vasectomy Recovery Shorts were born. There’s nothing else like them on the market. I created the initial prototype for my own surgery and they were amazing. I didn’t have to choose between pain and immobility. I was pain-free without being restricted to the couch. The prototype worked so well for my own vasectomy that my friends and co-workers had to have a pair for themselves as well. Everyone loved them. That original prototype has been refined and reiterated over the years and is now available to you. The problem of pain and immobility from a vasectomy has been solved. Vasectomy Recovery Shorts provide the snug scrotal support prescribed by your doctor and they have a built in compartment for an ice pack. Vasectomy Recovery Shorts replace the jock strap that is often recommended by doctors. Our shorts provide the same support but are more comfortable, discrete and allow for cold therapy while you’re on the go. They also work great when you’re lying down or on your side. The ice pouch keeps the cold exactly where it needs to be no matter your position. Your Vasectomy Recovery Shorts will fit comfortably under slacks or jeans, easily allowing for continued, snug scrotal support when you return to work. 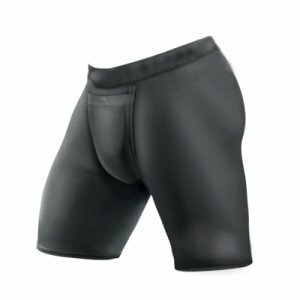 Once you’re fully recovered, these high-quality compression shorts can continue to be used for running or working out. Order your Vasectomy Shorts Now! Don’t let your vasectomy cause you pain and inconvenience.